Neck stretches are many and varied, and some of these exercises should be used carefully, particularly if you have neck pain. However, I am going to share with you neck stretching approaches that I find most useful on a daily basis in my physiotherapy clinic. There are many simple pleasures in life, but one of my favourite is a good neck stretch! We had a closer look at neck anatomy in another article, we can see that your neck is made up of 8 bones called vertebra stacked one on top of the other. Ligaments and muscles surround these bones keeping them together. The role of a ligament is to attach one bone to another and they are similar to the thread in a necklace holding and connecting the pearls together! Little nerves pass between each of these bones and are responsible for fuelling the muscles in your neck and arm to work correctly. Nerves can be seen as network cables, passing information to and from your neck and arm muscles. 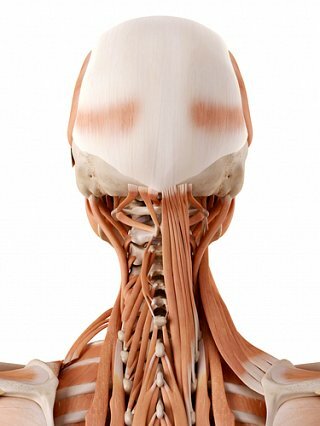 Around these bones, ligaments and nerves are the many muscles responsible for moving and supporting your neck. So, if these muscles become tight they can pull your bones out of alignment. As a result of tight muscles, the nerves and soft tissues in your neck may become strained. The end result is neck pain and dysfunction. 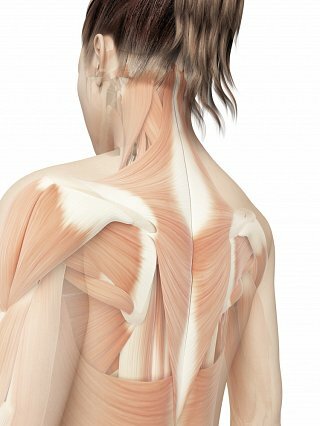 Muscles in your neck typically become tight slowly over time - they never become tight overnight! That is, if you sit or stand in a poor posture you will eventually end up with some of your neck muscles becoming tight. On a daily basis people come to me and tell me that they have developed neck pain overnight. However, the simple reason is usually that the pain they are experiencing is the end result of long-standing poor posture, where their neck muscles have gradually tightened resulting in their neck or back pain. This is similar to wearing a tight pair of jeans. As you know, you can wear tight jeans for months without any problem, and then on that special day they rip open! This is not as a result of an immediate weight increase but rather as a result of a gradual wearing over time! You can help your neck muscles to relax and become less tight by sleeping with a good orthopaedic pillow. This enhances your posture while you sleep and helps prevent your neck muscles from becoming tight. My answer has generally two components - that you need to correct your posture and to stretch your neck muscles frequently. Firstly, correcting your posture involves standing and sitting correctly. In effect, it’s about realising and maintaining a good posture. Secondly is stretching your neck. As I mentioned earlier, there are many and varied neck stretches out there, but I am going to share with you the stretches that I find most useful on a daily basis in my physiotherapy clinic. You are safe to do these stretches if you have either minimal or no pain in your neck, shoulder, arm or upper back. Stand tall and side bend your neck to the right. Hold it for 20 seconds. Repeat it to the left. Repeat both five times in each direction. Stand tall and turn your neck to the right. Hold it for 20 seconds. Repeat it to the left. Repeat both five times in each direction. Stand tall and bring your chin forwards to your chest. Hold it for 20 seconds. Repeat it five times. Stand tall and arch your head backwards. Hold it for 20 seconds. Repeat it five times. Do these exercises daily as a preventative measure for your neck pain. However, postural correction is a necessity in combination with this, as poor posture combined with these stretches may cause further pain. Seek professional help on postural correction when needed.